Ao Salad is placed in a stunning bay and has a narrow road running alongside the roofs of the stilted houses beneath, a temple, and a 30 meter Buddha that is marvelously completing the picture. 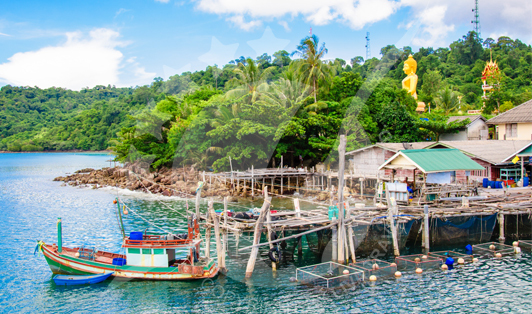 The only way to reach Koh Kood is by taking a boat from the mainland, as it sits in a remote place that is totally away from all the hustle and bustle, where there is just you surrounded by God’s creations. The Pier basically works as a connection to the Thailand mainland. A number of two crossings operate per day as an average, however, the times and duration of the crossings are subject to change depending on the season.